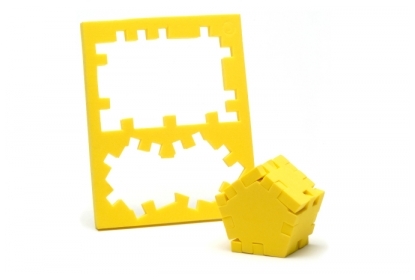 The Jimble Jumble puzzle frame consists of 8 puzzle pieces. Jimble Jumble is Happy Cube model Barcelona combined with the Space Puzzle, delivered in one single frame. With two pentagonal Space Puzzle pieces and six square Happy Cube pieces, you can build a Pentabox as well as a cube!